What's the most suitable canvas for oil painting? Linen, however, is relatively expensive, and cotton canvas is a good substitute. The cotton panels that fit in your paint box are the most convenient for painting outdoors and are inexpensive. They are light in weight, too, and have the added advantage of not taking up much space when stored in your studio. The main disadvantage of any type of panel is its lack of resiliency. Stretched canvas, whether cotton or linen, has a drum-like quality that seems to add vigor to your brush stroke. It also has the advantage of being available in several types of surfaces,from extra-smooth (double-primed) to very rough. You will find a medium-rough texture best for all-around work; extra-smooth is generally used for portraits. These various textures are not available in canvas panels. When a panel is made, its adherence to the board flatens out the texture. I suggest that you use panels when working outdoors and stretched canvas when developing your painting indoors. Alternatively, you may want to make your own canvas panels. Many artists use Masonite, which can be bought at any lumber supply house. While several thicknesses are available, the 1/8 inch is the least expensive and can safely be used in any size up to 24 x 30 inches. Masonite has a rough and a smooth side. Both surfaces are usable, but the rough side gives an uninteresting and monotonous texture to the finished painting and also requires much more paint to cover the surface. Use the smooth side for outdoor work, when you need speed to capture a changing scene. Whichever surface you use, you should first rub it with sandpaper, then you should brush on a coat of flake white. When the first coat is dry, give the panel another coat if the brown undertone of the masonite shows through. The panel is ready for use as soon as the final coat of white lead is dry to the touch. To save time you could get the the art supply shop to cut a number of boards to the required size. Then you can coat all of them at once. 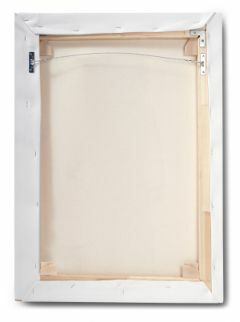 Besides canvas and Masonite, there are various synthetic painting boards on the market. Since they are substitutes for real canvas, they cost less and are not as durable. You can even make your own panels with a good quality chip board, a heavy gray cardboard. Chip board will last longer if you give it a coat or two of shellac to reduce its natural absorbency, and a coating of flake white over that will create a more receptive surface. Covering the back as well as the edges with shellac will seal the panel against moisture and add somewhat to its durability.